Friendship and magical realism sparkle on the page in this heartwarming, delightfully eccentric illustrated middle-grade gem from an extraordinary new literary voice. Perfect for fans of A Snicker of Magic and The Penderwicks. Alberto lives alone in the town of Allora, where fish fly out of the sea and the houses shine like jewels. He is a coffin maker and widower, spending his quiet days creating the final resting places of Allora's people. Then one afternoon a magical bird flutters into his garden, and Alberto, lonely inside, welcomes it into his home. And when a kindhearted boy named Tito follows the bird into Alberto's kitchen, a door in the old man's heart cracks open. Tito is lonely too--but he's also scared and searching for a place to hide. Fleeing from danger, he just wants to feel safe for once in his life. Can the boy and the old man learn the power of friendship and escape the shadows of their pasts? Matilda Woods (www.matildawoods.com) grew up in the small town of Southern Tablelands, Australia. She graduated from Monash University with a Masters of Social Work. Matilda splits her time between writing middle grade fiction and working as a youth social worker. 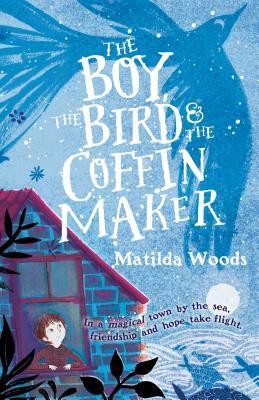 The Boy, the Bird & the Coffin Maker is her debut novel. She currently lives in the same small town where she grew up, with her four chickens, three dogs, two cats and one bird. Follow her on Twitter @MatildaWrites.